I am currently still reading "Seven Things That Steal Your Joy" by Joyce Meyer, and something struck me yesterday I decided to make it a post entry. Indeed it turned out that simplicity almost always yield better result than complicatedness. Not only it enables you to focus on making bigger decisions, it will make you happier and peaceful as a person. Have you ever wondered why your life is such as mess, but some people can live happily regardless of the external circumstances they may be facing? Found this on the web and so happened that it fits perfectly well with my title! Personally, I used to be very complicated person and because of that got frustrated easily. Then I realised it was ME who made it complicated. I have the choice to make it simpler if I allow it to. And so I chose to live simple. It is in simplicity I found peace. In simplicity, I am able to focus my energy on making bigger decisions, or simply perform more effectively in doing my daily tasks. Do you realise sometimes you can get quite frustrated even when choosing what to wear or where to eat? That's why I have a daily routine, on what to wear, where to eat, what to eat and so on. The truth is, if you are being indecisive on all the small decisions stated above (I can get quite indecisive at times), it will drain out your energy. I know I can get tired easily just by having all these mental conflicts happening in my head. So what I do every morning and almost every day are pretty much predictable. First I will go to gym (I can get myself ready within 10 mins because I have prepared everything the night before). Then I will eat breakfast (almost always mee/mihun with egg plus fresh fruit juice for now, until I get bored of it), after which I will read some blogs/books and start writing. You may think I am boring! It's fine, I probably am. But by making all these small decisions an automated individual system, I am able to direct my energy on training my idea muscles. I can work or write more effectively, putting my limited brainpower on producing something more significant. 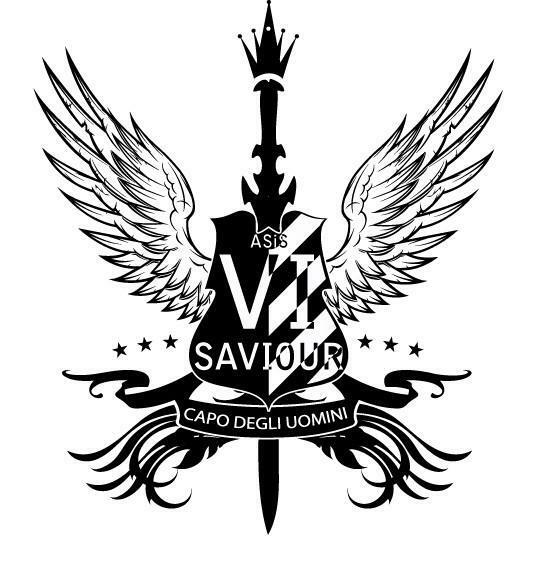 Again what is significant for me may not be significant for you, so you have to figure out your own top priorities that demand your highest concentration level. At the same time, drop everything else that are not so important and make them automated. Back in the UK, I used to check out all the current accounts that yield the highest interest rates. Whatever current accounts that you can name, I probably have had opened it at one point in my student life. But there were always some requirements you need to fulfill, such as "you need to debit at least £750 into your account every month" and "you need to have two direct debits" etc, to be eligible to earn interest for that month. To be honest, they are not that difficult. If you have double the amount (say £1,500) in your account, you can always open another backup account and set up a standing order/instruction to transfer the money on a specific date of the month. I have done that throughout my whole three years in the UK, and earned my groceries money just from the interest alone. Banks (at least the retail side) are not always sophisticated if you know how to navigate your way around. Simplicity links well with elegance too. Two months ago when I was travelling in Switzerland with my family for my graduation trip, I was looking for a watch. 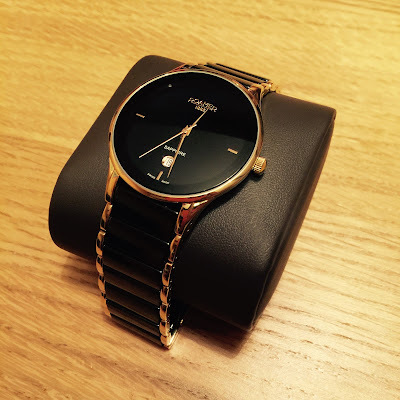 My parents favoured Tissot (quite a popular Swiss watchmaker) so I was looking. But I can't seem to find a watch that manage to catch my attention, not because they are cheap, but too complicated. And then a watch caught my attention in Lucerne! Roamer. I had never heard of this name so I was skeptical of its quality and reliability. I gave it as pass the first round. Then I went on and continued my trip. This time round we were in Lauterbrunnen, a quiet town near Jungfraujoch. I was still looking for a nice watch. Again the same Roamer watch caught my attention. I gave it a pass again. On our way back from Jungfraujoch, we went by this small little town at Wengen, and... you guessed it right! Again the same Roamer watch managed to catch my attention. Maybe it is fate bringing us together. I don't know, but I decided to check out more about it. I was told Roamer is a Swiss watchmaker of the same tier with Tissot in performance and quality, but it is more renowned among the local Swiss people, not so much on international marketing as compared to Tissot. That's it! I decided to seal the deal. My parents warned me of the potential consequences but I am firm in making this decision. What is it in Roamer that fascinates me so much? See it for yourself. Often people mix up complicatedness with complexity, when they are not exactly the same. Complicatedness is made up of a large number of individual components which can be broken down and reduced to smaller parts, and be dealed with individually. But complexity may not be comprehensible easily even if broken down into its individual form. Take for instance, an iPhone. The reason I am an iPhone user speaks on its own, I personally prefer iOS system than Android system, simply because it is more user friendly. You see, things that are user friendly will always win because many people prefer simplicity. When things get complicated, not everyone will be able to understand or even bother to understand it. Amazon and Alibaba are another two fine examples. Because it was so easy for users to just click on their websites to purchase items, these companies strived! Jack Ma once said in a forum that if he himself can't understand something on his company website, he will ask the experts to make it simpler, regardless of how onerous the challenges are. Again simplicity to the users is the direct opposite for the producers, it means complexity. It is complex but not complicated. 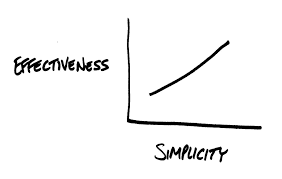 Simplicity is about putting order to complexity. So, would you rather live a complicated and frustrated life, or simple yet effective life? 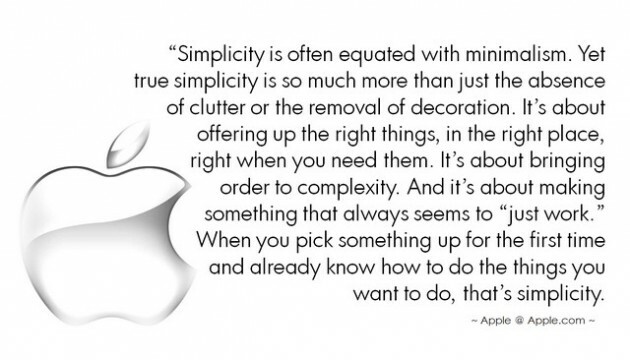 Here's a nice definition by Apple regarding simplicity, something nice to ponder today.